So what, exactly, is the mystery? What has happened to Dr. Earle? Did he vanish on his own accord? Was he kidnapped? Or could it be murder? Scotland Yard’s Inspector French is brought in to solve the case. 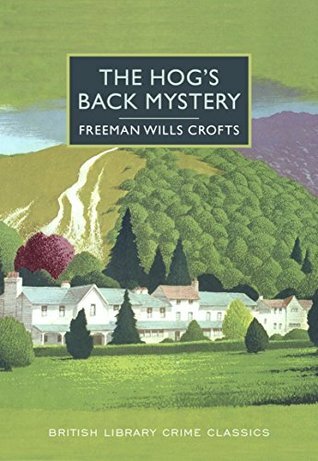 The Hog’s Back Mystery is a slow and steady book. It does not begin with Dr. Earle’s disappearance; Mr. Crofts takes time to introduce us to his characters first. When French hits the scene, he is a methodical investigator. Inspector French reminds me a bit of TV’s Lt. Columbo – French leaves no stone unturned, and questions suspects to the minute detail when making his inquires. The mystery was complex, and I personally was unable to fully solve it, there were so many pieces. I enjoyed following French’s investigation and his line of thought, and his full explanation was welcome in the end. A fun classic whodunit. Thanks to NetGalley and Poisoned Pen Press for providing me with a free copy of this book in exchange for an honest review. This sounds different, and fun! I’ll have to look for it. The author put a lot of thought into his mystery and solution. It was fun to read.